Is that a rubber band gun, or a pen? I guess it depends on who you are trying to convince this product is a good idea. If you are a kid trying to impress your friends, it is totally a gun used to shoot bands of colored rubber in the direction of other kids. 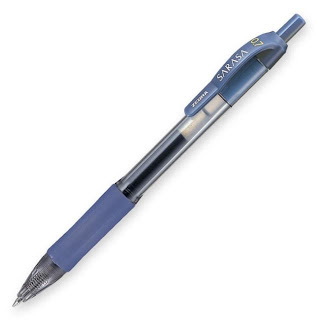 If you are a kit trying to convince your parents and/or teachers that you are to grown up for shenanigans, then it is a pen. If you are not a kid, then this product is a cheap conglomeration of two otherwise useful products. The Rubber Band Shooter Blaster Supreme (what a name) is the follow up to the Rubber Band Shooter. You can waste a few minutes of your day and compare the two, but basically the Blaster Supreme version of the product will shoot a rubber band more often and not get stuck when compared to the previous version. I see no advantage to using this gun over the standard wrap the rubber band around your hand maneuver. 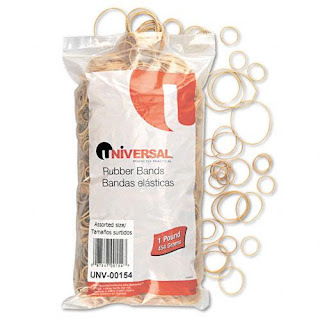 The marketing geniuses at Hogwild toys will even sell you rubber bands that are specifically sold to work with your Rubber Band Shooter (also notice they never call it a "gun"). But you know what? I'm in a generous mood today. So here's some free advice. Don't waste your time or money on this rubber band shooter/pen contraption. Just go out and purchase some real pens and use those to write. You can't go wrong with a Zebra Sarasa, so just add them to your online shopping cart. I just gave you permission. Really? 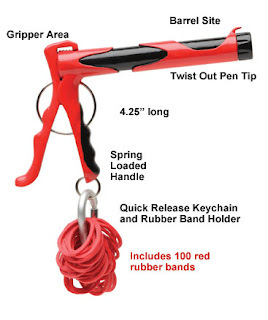 Just a pen isn't enough for you, you still want to shoot rubber bands at your friends and family? Well go ahead and pick up a bag of assorted rubber bands. You'll have a pound of various and oddly shaped rubber bands so you can shoot the smaller ones at Little Suzie, and bigger ones at Lumberjack John. There, now don't you feel smart for not getting pulled into the lure of yet another rubber band gun? You are not only incredibly smart, but incredibly good looking as well. Congratulations. If you are counting the number of times I post content that is way behind the times prepare to put another notch in your bedpost. But I was just pointed to an article in the New York Times from October of 2008 that caught my eye. Apparently, when tape is unpeeled in a vacuum it unleashes a fair amount of energy. Some of that energy is largely available as x-rays, but when unpeeled in a normal office environment so sadly you won't get to x-ray your co-workers. Don't go trying to perform this experiment inside your Hoover Vacuum, they mean a proper scientific vacuum. 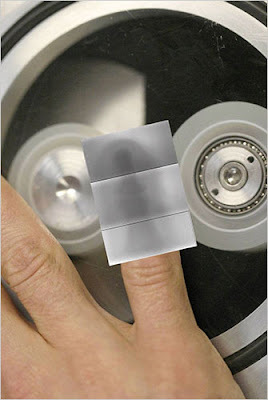 But technicalities aside, some scientists were able to create an actual x-ray image of a thumb using just scotch tape in the proper conditions. The experiments with duct tape, but not masking tape (read the article for details). 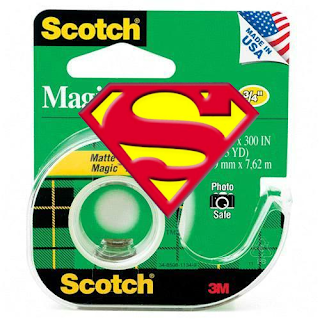 So go ahead and live out your dreams of becoming a super hero and buy some Scotch Tape. I can't promise you that you'll fly or have ice breath, but you can have x-ray vision if you have access to the proper scientific equipment. But really, who needs super powers when you have the power to safely affix photos to your scrapbook with superb archival quality adhesive. A link was recently sent my way to a site talking about Stanley Kubrick's quest for a perfect box. G. Ryder & Co. Ltd. were approached by Kubrick's people because Stanley wanted a box with a lid that wasn't too loose or too tight and was the perfect size. You can watch a video that looks to be part of a different documentary by visiting the G. Ryder & Co. Ltd. site and pressing the Kubrick Video button in the lower right corner. It'll be worth it just to hear somebody say "It's a Lovely Box." They don't actually discuss the dimensions of the box and some people report the box is still for sale, but I wasn't able to find any information to back up the claim. In a day and age where there are hundreds of boxes for hundreds of uses, it is difficult to sift through the rabble and find a decent substitute. 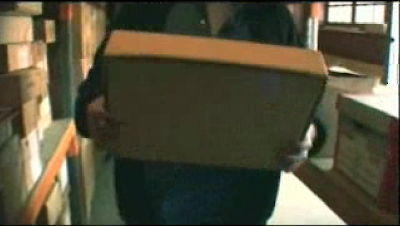 I could tell by the video that the Cardboard Kubrick Box was wire stitched, but checking for that only came up with results of wire stitched notepads and wire stitched brooms. So we have to throw out a properly constructed box. We are going to have to make some compromises in the quest for a general facsimile, but we know we know the general shape and we know it needs to be high quality. Unfortunately, we have to forgo the ever important lid to get an appropriate sized box. With the string and button closure instead of a lid it is actually a little easier to keep the box closed, but allows easy access without the lid sticking. I don't have the proper dimension of the Kubrick box but this looks about right. Fellowes produces several varieties of these boxes so you can find the one that makes you feel the most like Kubrick and stock up. 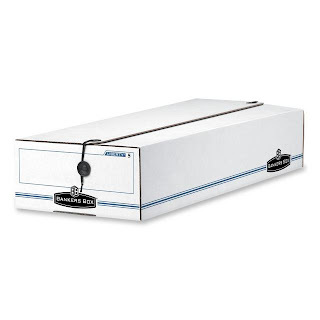 Take special note of Fellowes 4.25" high, 9.25" wide and 23.75" deep box as it is the most economical of the group. I don't often blog about the standard #2 pencil because they are boring and only serve as a reminder of hours spent filling out Bubbles for uncaring Scantron machines. I like a normal pencil for a few things, but mostly I prefer pens. People who know me know that I'm a sucker for a Dixon Ticonderoga. Why? I couldn't tell you, but of all the #2 pencils in the world it's my favorite. I've previously blogged about Sharpie's Liquid Pencils several times and even once about a Pencil Sharpening Service, but never about the lowly #2 pencil and I don't plan to start now. I found a couple odd takes on the usual pencil. Here is a pair of pencils cleverly disguised as chopsticks in hopes of raising awareness for human rights violations in China. Visit the site linked above for more details and to read the text included on the packaging. 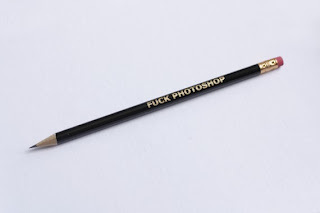 This pencil is on sale on Etsy for only 3 dollars. If you want to give a middle finger to digital artists because you do things old school then why not buy it. I'm pretty sure the pencil you actually get won't be as nice or as interesting a conversation starter as the Dixon pencil made from recycled tires. Why are we cussing at a computer program anyway? Why don't we cuss at things everybody can agree to hate, like Cancer.